On August 31, 2018, Prince Albert II of Monaco and his wife Princess Charlene, their twins Crown Prince Jacques and Princess Gabriella attended the traditional Monaco's end-of-summer picnic (Pique-Nique) events held at the Princess Antoinette Park (Le Parc Princess Antoinette) in Monaco. The event is organised by the City Council of Monaco and features folk dancing, flowers, a Mass and barbecues. Today is August 31 and Queen Rania of Jordan celebrates her 48th birthday. Rania Al-Yassin was born in Kuwait on the 31 August, 1970 to Palestinian parents. Since marrying the now King of Jordan in 1993, she has become known for her advocacy work related to education, health, community empowerment, youth, cross-cultural dialogue and micro-finance. On occasion of 48th birthday of the Queen, Royal House of Jordan published a new photo. Happy 48th birthday to you Queen Rania. Prior to 2018 World Food Summit which was opened officially on Thursday, Princess Marie of Denmark appeared as a guest on DR - Aftenshowet TV show which is the leading TV show of Denmark dealing with current events in Denmark. Princess Marie gave an interview to DR Aftenshowet, relating to food wastes and 2018 World Food Summit. Princess Marie is the patron of World Food Summit. 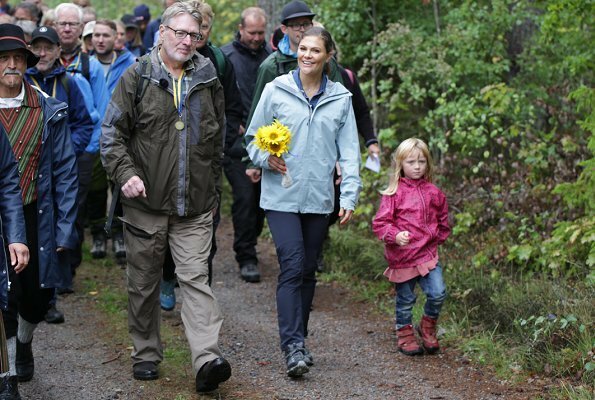 The 13th hiking of Crown Princess Victoria in Sweden takes place in Dalsland on August 31, Friday. The Crown Princess began her hiking in Svankila Nature Reserve. She hiked along the coast of Spången and Östebosjön lakes on Pilgrim way which reaches Upperud. Pilgrim Way is a 100 km natural pathway which passes through the rural area. The Crown Princess who arrived in Upperud hiked towards Håverud where she attended celebrations of 150th anniversary of Dalsland Canal. Happy birthday to you, Prince Gabriel, Duke of Dalarna! 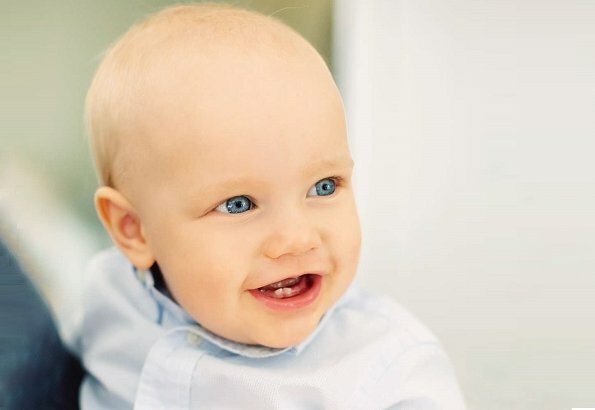 Swedish Prince Gabriel celebrates his first birthday today. Swedish Royal Court released a new photo on the occasion of that birthday. Prince Gabriel is the second child of Prince Carl Philip and Princess Sofia. He is a grandson of King Carl Gustaf and Queen Silvia. His elder brother is Prince Alexander, Duke of Södermanland. Prince Gabriel is sixth in the line of succession to the Swedish throne as of June 2018. 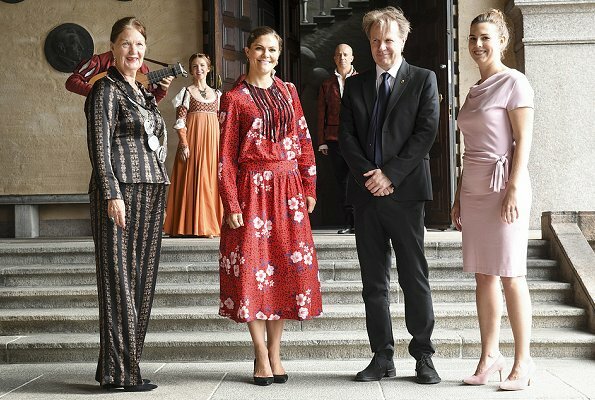 On August 30, 2018, Crown Princess Victoria of Sweden attended a lunch held in connection with Ingmar Bergman's centenary at Stockholm City Hall. Ernst Ingmar Bergman was born on July 14, 1918 in Uppsala and died on July 30, 2007 on Fårö. He was a Swedish film and theatre director, writer, theatre manager, dramatist and author. Ingmar Bergman wrote or directed more than 60 films and 170 theatrical productions. In addition, he wrote more than a hundred books and articles. 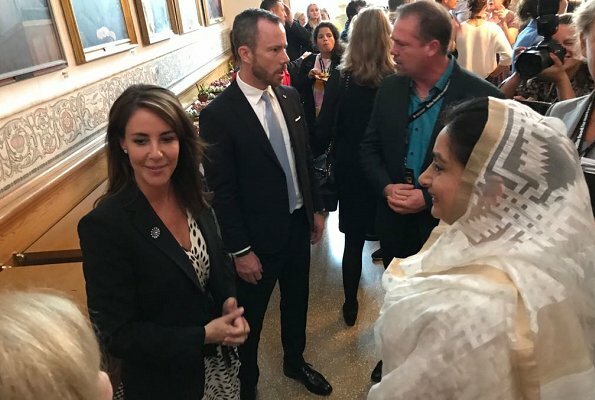 On August 30, 2018, Danish Princess Marie opened "World Food Summit – Better Food for More People in Copenhagen" forum. World Food Summit – Better Food for More People 2018 takes place on August 30 and 31, 2018 in the National Parliament of Denmark and in Bella Center Copenhagen which is Scandinavia’s largest trade fair and congress center. The annual World Food Summit – Better Food for More People in Denmark is the central forum for discussing food problems in the world and various action plans are determimed at that forum. Princess Marie became the patron of Copenhagen Food Summit in 2017. (Princess Marie wore a silk dress by DNYK). 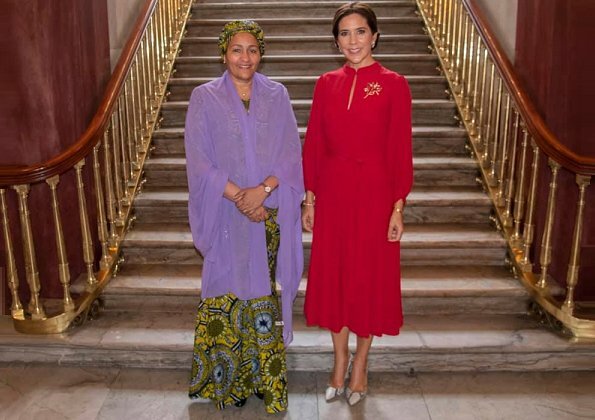 Tuesday 28 August afternoon, Crown Princess Mary of Denmark met with the United Nations Deputy Secretary-General Amina J. Mohammed at Christian VII’s Palace in Copenhagen. United Nations (UN) Deputy Secretary General Amina Mohammed was in Copenhagen to attend World Water Week 2018. Amina J Mohammed, 57, became deputy secretary-general of the United Nations in February 2017. She was previously minister of environment of the Federal Republic of Nigeria. 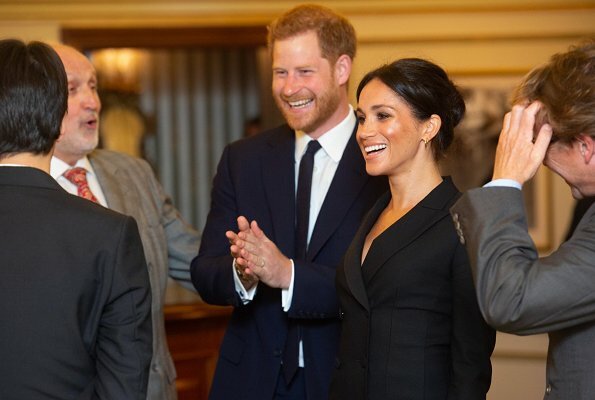 On August 29, 2018, Prince Harry and the Duchess of Sussex attended a special performance of "Hamilton" in support of Sentebale at Victoria Palace Theatre in London. The special event is raising awareness of Prince Harry's charity, Sentebale, which supports the mental health and wellbeing of children and young people affected by HIV in southern Africa. (The Duchess wore the digital dress by Canadian label Judith & Charles. The tuxedo-style mini 'Digital' coatdress retails for $550). 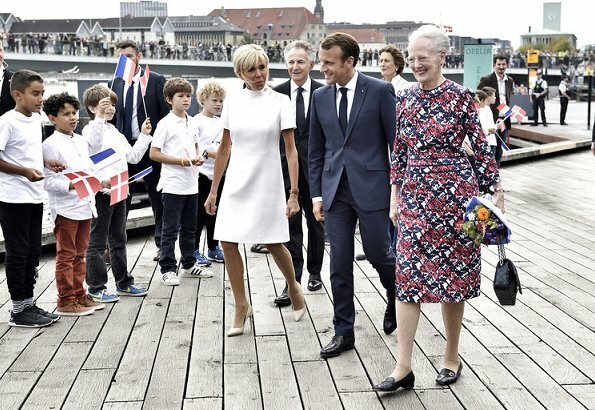 On August 29, 2018, 2 day Denmark visit of French President Emmanuel Macron and his wife Brigitte Macron ended with a traditional farewell ceremony held at the Royal Theatre in Copenhagen. At the farewell ceremony, Queen Margrethe II, Crown Prince Frederik, Crown Princess Mary, Prince Joachim and Princess Marie were present. (Crown Princess Mary wore a new floral petal printed dress by Giambattista Valli. Princess Marie wore a floral lace dress by Huishan Zhang, which she had worn before). King Harald V of Norway and Queen Sonja of Norway celebrate their 50th wedding anniversary (Golden Wedding). The Royal Couple celebrated their 50th wedding anniversary with a special service held at Oslo Cathedral. 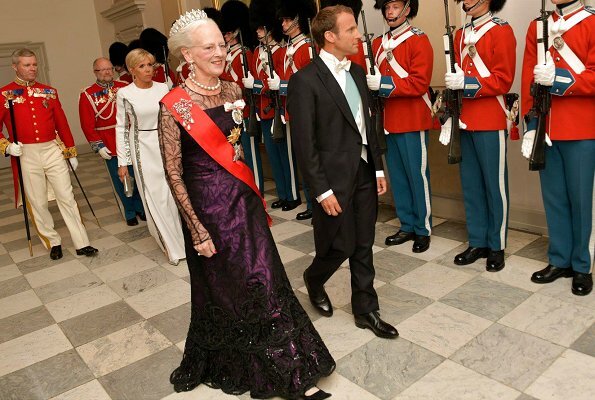 During the celebrations, Crown Prince Haakon, Crown Princess Mette-Marit, Princess Ingrid Alexandra, Prince Sverre Magnus, Princess Märtha Louise, Emma Tallulah Behn, Leah Isadora, Maud Angelica and Princess Astrid, Mrs Ferner were present. 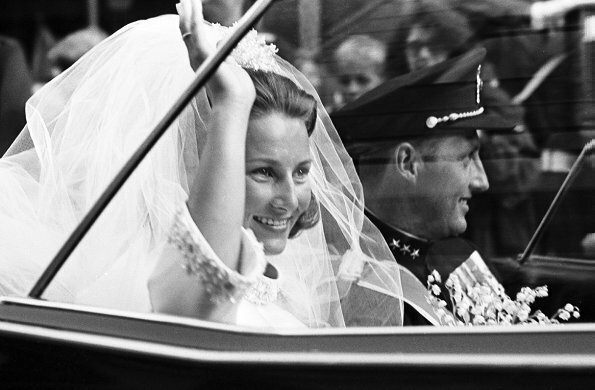 King Harald got married to a commoner, Sonja Haraldsen at Oslo Cathedral on August 29, 1968. 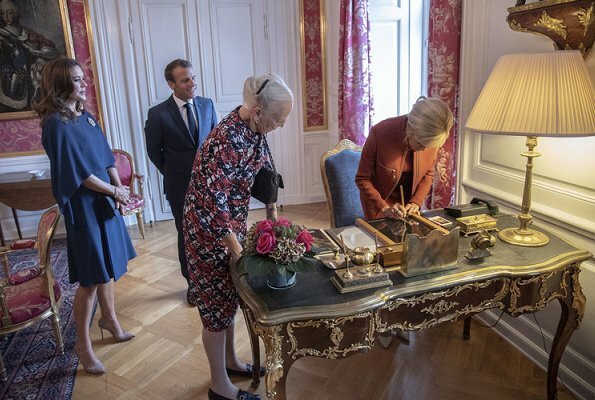 On the second day of state visit of French President and his wife to Denmark, Queen Margrethe, Crown Prince Frederik and Crown Princess Mary bid farewell to President Emmanuel Macron and First Lady Brigitte Macron at Christian VII’s Palace, Amalienborg, and there the guest book was inscribed and window panes were signed. 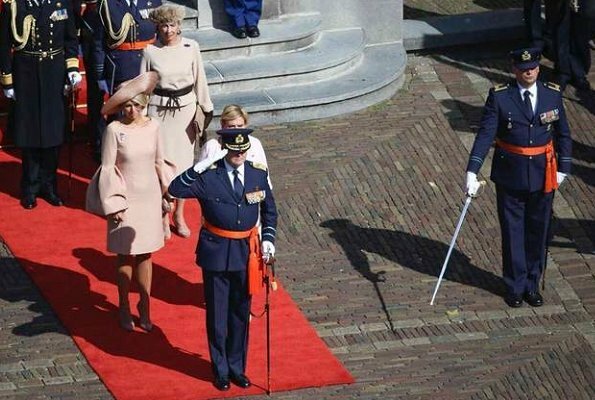 The Belgian royal palace shared pictures on Tuesday morning of the Crown Princess ready for her departure and being waved off by siblings, Prince Gabriel, Prince Emmanuel and Princess Eléonore. Belgian Crown Princess Elisabeth left her country for the Atlantic College in the Vale of Glamorgan in Wales. 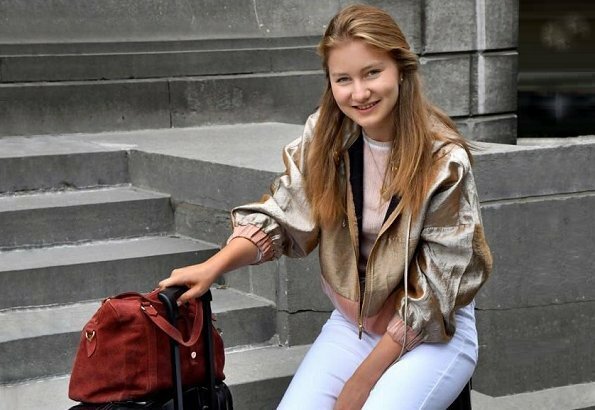 The 16-year-old Crown Princess will complete her secondary school education in the principality. Crown Princess Victoria of Sweden presented 2018 Stockholm Junior Water Prize to Caleb Liow Jia Le and Johnny Xiao Hong Yu from Singapore, with a ceremony held at Berns Salonger. Stockholm Junior Water Prize is an open contest for young people between the ages of 15 and 20. The contest aims to encourage young people to find creative sustainable solutions for the environment. The Crown Princess became the patron of Stockholm Junior Water Prize in 1994. The prize is presented in the World Water Week. A prize of USD 15,000, a blue crystal prize sculpture, a diploma and also the stay in Stockholm is given to the winner of Stockholm Junior Water Prize. 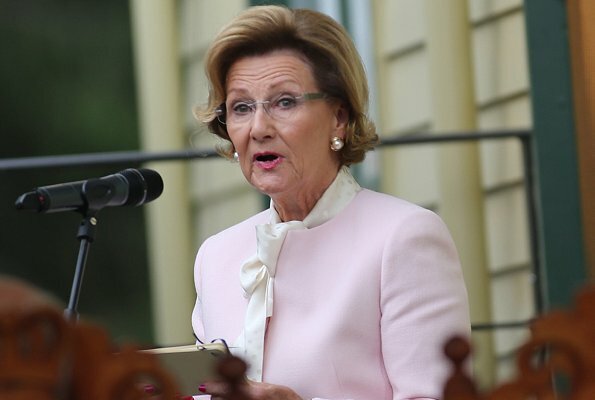 On August 27, 2018, Norwegian Queen Sonja opened her childhood house at Maihaugen open-air museum. King Harald, Crown Prince Haakon, Crown Princess Mette-Marit and Princess Märtha Louise of Norway attended the opening ceremony. Funkisvillaen was transferred to Maihaugen open-air museum in Vinderen in Oslo in the autumn of 2016. Professionals at the museum renovated the house in compliance with the architecture of the years between 1935 and 1968 when the Queen and her family lived in that house. The house is an example of 1930s architecture and the Queen lived in that house until 1968. Queen Sonja's childhood house will be open to the public from August 30 to the middle of October at visiting hours of the museum. 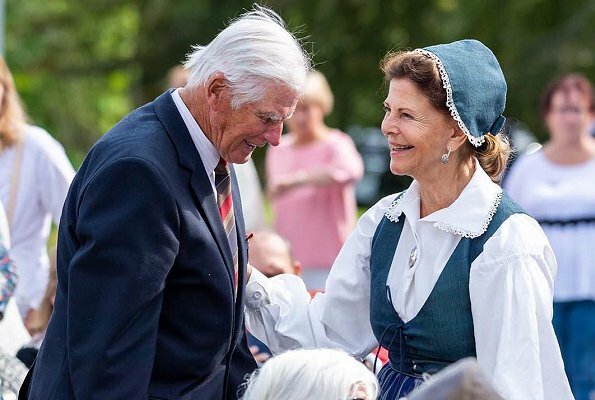 On August 27, 2018, Monday, Swedish Queen Silvia visited Pensioners' Day 2018 event held at Ekebyhov Palace Park in Ekerö near Stockholm. The event is held for the 20th time this year. In the early years, the event took place as a picnic held by Queen Silvia at Drottningholm Park. 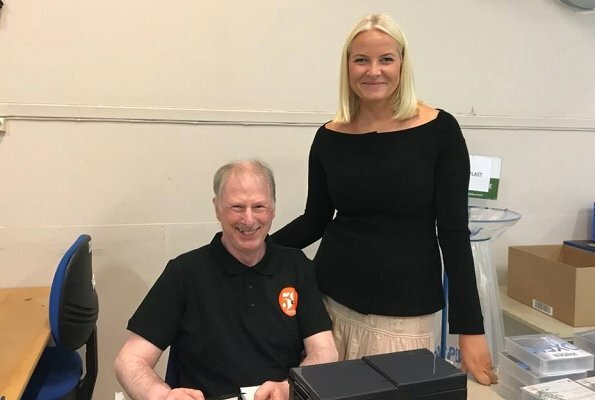 Since 2000, Ekerö Municipality hosts Pensioners' Day event. On August 26, 2018, Queen Rania of Jordan visited projects carried out by Al Kifah Cooperative Society in Ajloun Governorate and met with its women beneficiaries to learn about their efforts in organic and sustainable agriculture. The initiative aims to raise awareness about organic farming, increase the variety of available organic produce, reduce production costs by buying farming material in bulk, guarantee the adherence of society members to organic farming procedures. 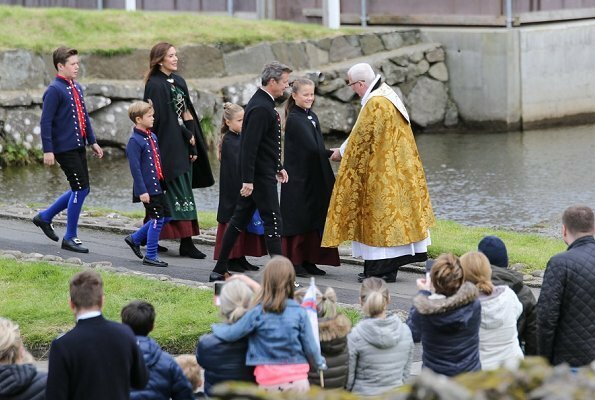 On the fourth and last day of their state visit to Faroe Islands, Crown Prince Frederik, Crown Princess Mary, Prince Christian, Princess Isabella, Princess Josephine and Prince Vincent visited Sandavági. The Danish Crown Prince family attended a church service at Sandavágs kirkja in Sandavági. The Crown Prince family attended a lunch hosted by bishop Jógvan Fríðriksson at the old warehouse in the village Bøur, and they officially depart the Faroe Islands afterwards. 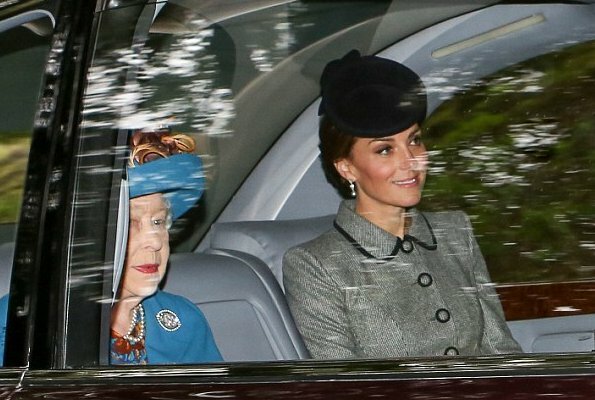 The Duke and Duchess of Cambridge joined the Queen for church service in Balmoral this morning after arriving in Scotland for their summer holiday. (The Cambridges enjoyed a fortnight on the paradise island of Mustique with the Middletons and spent much of the summer at their Norfolk country home Anmer Hall). Prince Charles, Princess Anne, Prince Edward, Sophie, Countess of Wessex, Lady Louise Windsor and Autumn Phillips were also attend church service. Crathie Church is near Balmoral and the Queen regularly attends church service in her annual holiday. Yesterday evening, on August 25, 2018, Crown Prince Frederik and Crown Princess Mary held a reception aboard the Royal Yacht Dannebrog in Tórshavn for municipality officials and other guests and the reception was attended by Prince Christian, Princess Isabella, Princess Josephine and Prince Vincent. (Crown Princess Mary wore the floral embroidered midi dress by Vilshenko, which she had worn before). On the third day of official visit of Danish Crown Prince family to Faroe Islands, Crown Prince Frederik, Crown Princess Mary, Prince Christian, Princess Isabella, Princess Josephine and Prince Vincent visited Bakkafrost company, and Bylgjan Sports Hall in Runavik. The Crown prince family met with the local sports organizations. Belgian Royal family, that is, King Philippe, Queen Mathilde, their children Crown Princess Elisabeth, Prince Gabriel, Prince Emmanuel and Princess Eléonore are making a private visit to Armenia in order to spend their summer holiday together and see historical and cultural assets of the region. 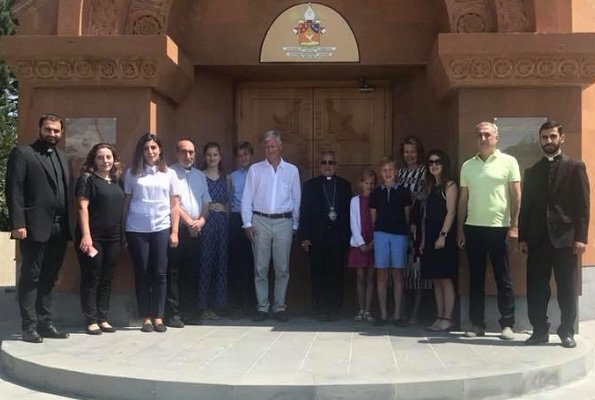 On August 23, King Philippe of Belgium visited Cathedral of the Holy Martyrs in Gyumri together with his family. The cathedral is the Eastern Europe ordinariate cathedral of the Catholic Church. The family also visited Noravank Monastery in Vayots Dzor on 22 Aug. Noravank (New Monastery) was founded by Bishop Hovhannes in 1105. 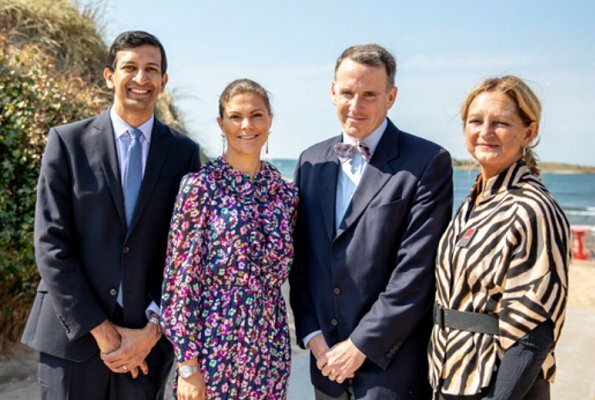 On August 22, Crown Princess Victoria of Sweden attended 2018 Tylösand conference held by SNS, an independent think tank at Tylösand Hotel. The theme of this year’s Tylösand Summit is urbanisation and the growing importance of cities in the economy. SNS has held an annual Summit in Tylösand since 1948. At the summit, about 200 chief executive officers, leading academic researchers, politicians from the government and the parliamentary opposition, civil servants and union leaders get together. 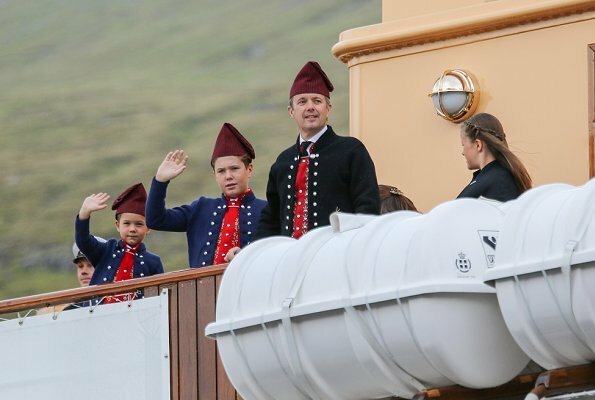 On the second day of official visit of Danish Crown Prince family to Faroe Islands, Crown Prince Frederik, Crown Princess Mary, Prince Christian, Princess Isabella, Princess Josephine and Prince Vincent wearing Faroe national costumes came to Klaksvik Harbour with the Royal Yacht Dannebrog and were welcomed by Mayor Jógvan Skorheim and his wife Vígdis Skorheim. The Crown Prince family will make various visits and attend events today. In the evening of August 23, Crown Princess Victoria attended the opening of Bergman Festival 2018 (Bergmanfestivalen 2018) at Royal Dramatic Theatre in Stockholm. The Crown Princess was greeted by project leader Ulrika Josephsson as she arrived for the opening of the Bergman Festival. 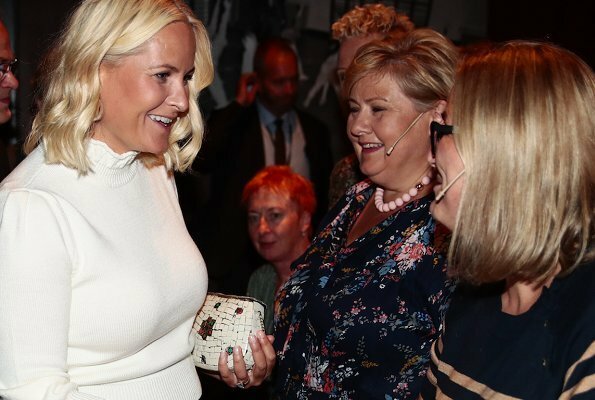 The Crown Princess attended the premiere of SAFE at Dramaten. Crown Princess Victoria is the patron of Bergman Festival 2018. 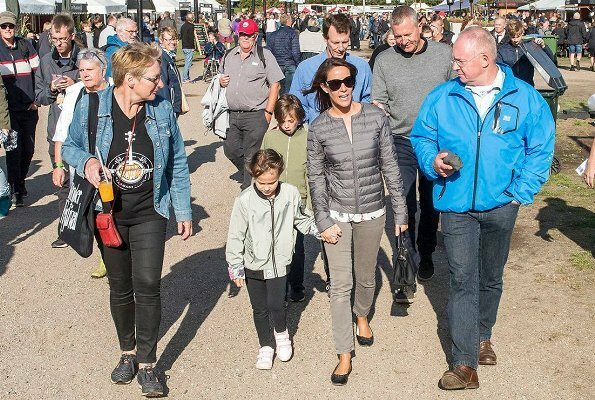 On August 23, 2018, Princess Marie of Denmark opened the annual Copenhagen Cooking and Food Festival in Copenhagen. Copenhagen Cooking & Food Festival is an annual event which celebrates the culinary culture of Copenhagen as well as the whole of Denmark as a great food country. Princess Marie is the patron of Copenhagen Cooking & Food Festival since 2011. 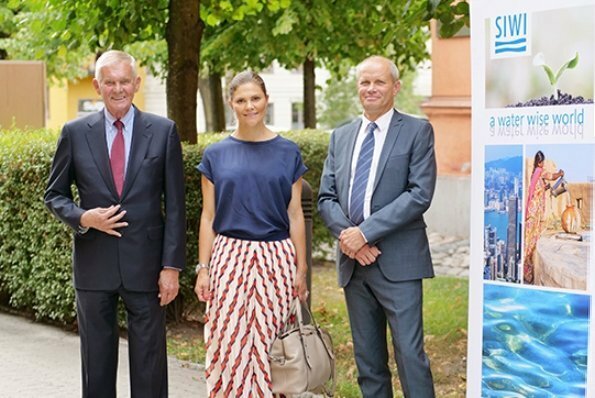 On August 23, Thursday, Crown Princess Victoria of Sweden visited Stockholm International Water Institute (SIWI). The Crown Princess was welcomed by Peter Forssman, the chair of SIWI and Torgny Holmgren, the executive director of SIWI. During the visit, the Crown Princess received information about the studies of SIWI on water. Since 2016, the Crown Princess has been the ambassador of Global Goals of United Nations (UN), who performs duty relating to sea and sea resources and in addition, objective 6, clean water and sanitation of water. 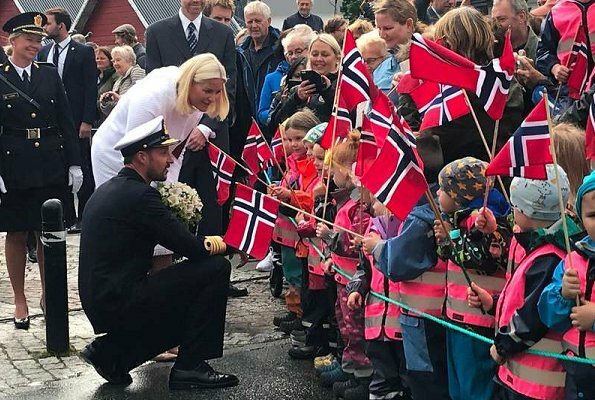 Today, in the morning of August 23, Thursday, Crown Prince Haakon and Crown Princess Mette-Marit of Norway came to Maloy Harbour and attended the official opening of Måløy Raid Center which is a war history documentation center. Måløyraid Center is a National and International War History Information and Documentation Center which provides war history information about the World War II. Today, Prince Carl Philip, Princess Sofia and their son Prince Alexander, the Duke of Södermanland visited the Nynas Nature Reserve in Södermanland and attended the inauguration of Prince Alexander's Vantage Point, which is Södermanland County's baptism gift to Prince Alexander. When Prince Alexander was born, governor Liselott Hagberg asked from all the municipalities, if they wanted to contribute to Prince Alexander's baptism gift, which would cost SEK 400 000. 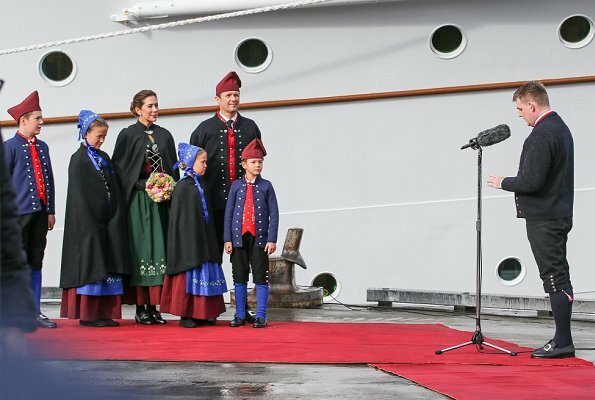 On August 23, 2018, Danish Crown Prince family, that is, Crown Prince Frederik, Crown Princess Mary and their four children Prince Christian, Princess Isabella, Prince Vincent and Princess Josephine came to Tórshavn with the Royal Yacht Dannebrog and began their four day official visit to Faroe Islands. 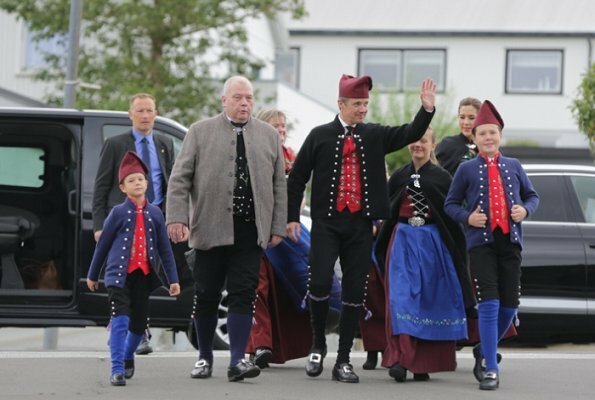 The family wears Faroe national costume which is traditionally used on festivity days. Faroe national costumes are used for celebrations of various festivals, national holidays, weddings, baptism and parties. 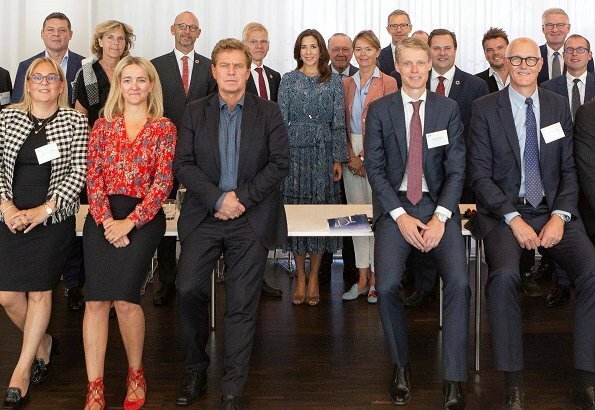 On August 22, 2018, Crown Princess Mary attended the first meeting of the SDG High Level Advisory Board established by Dansk Industri (DI) in cooperation with Global Compact Network Denmark and the Industry Fund, at Danish Industry head office in Copenhagen. (The Crown Princess wore a jacquard print maxi dress by Michael Kors). On August 22, 2018, Crown Prince Haakon and Crown Princess Mette-Marit of Norway visited OrbitArena in Jessheim. OrbitArena is a company that provides employment to unemployed people and that gives training courses suitable for demands of the labor market for people needing help to find a job. Afterwards, the Crown Couple visited Vietnamese Buddhist Community in Jessheim. Vietnamese Buddhist Community is one of the biggest buddhist communities of Norway with its more than 6000 members across the country. That community was established in 1982 a few years after the first Vietnamese refugee came to Norway. Today, the members of that community consist of Norwegians originally with a Vietnamese background. 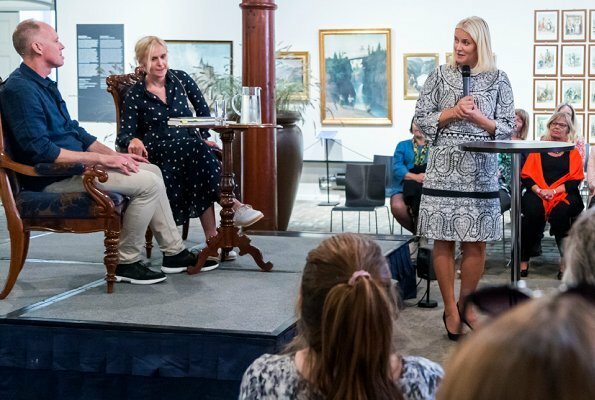 Yesterday, Crown Princess Mette-Marit attended a conference at Oslo House of Literature. The conference included a conversation of Prime Minister Erna Solberg and author Olaug Nilssen about the author's "Tung tids tale" book. Tung tids tale tells the story of the mother of a child with autism. At the conference, Erna Solberg had a conversation with Olaug Nilssen about how a novel can change our lives. The book was published in 2017 and tells the affection of a mother and the struggle of a mother for a different child. The book received various awards. The book was adapted to a theater play and the premiere of that play will be at National Theater in Nydalen on Friday. 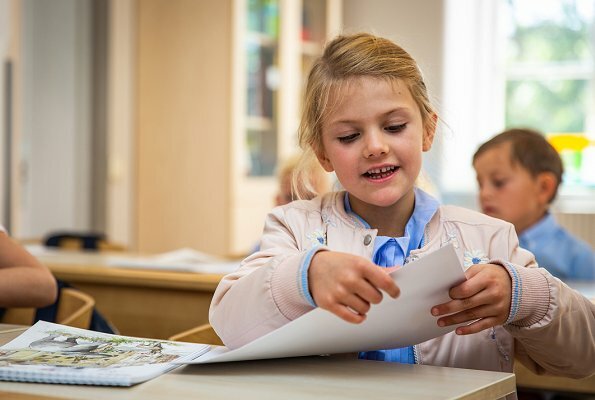 6 years old Swedish Princess Estelle started preschool class in Campus Manilla School in Royal Djurgården in Stockholm. Today, Princess Estelle and her parents, that is, her mother Crown Princess Victoria and her father Prince Daniel came to Campus Manilla and Princess Estelle met her teacher. Campus Manilla is a primary and secondary school located in Djurgården near Stockholm city. There are about 500 students in the primary school and 240 students in the secondary school. Campus Manilla is at a distance of nearly 10 kilometers from the Haga Palace. Today, Swedish royal family shared on their official Instagram account their photos taken in Solliden, Hälsingland, Gotland, Öland and Kalmarsund at different times during their 2018 summer holiday for their followers in Instagram. 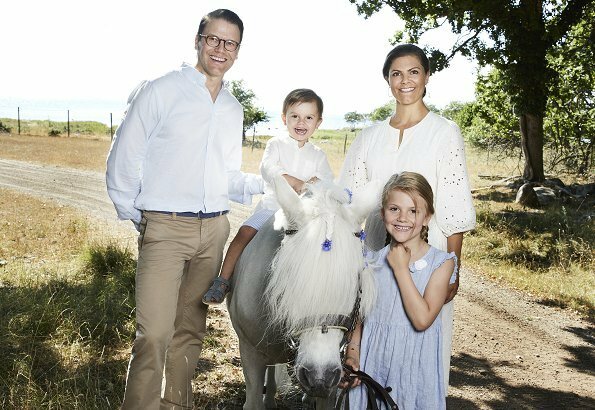 The photos show King Carl Gustaf, Queen Silvia, Crown Princess Victoria, Prince Daniel, Princess Estelle, Prince Oscar, Prince Carl Philip, Princess Sofia, Prince Alexander and Prince Gabriel. The photos were taken by royal photographer Anna-Lena Ahlström. On August 19, Sunday, Crown Princess Victoria and Prince Daniel visited Estonia on the occasion of celebrations of 100th anniversary of independence of Estonia. 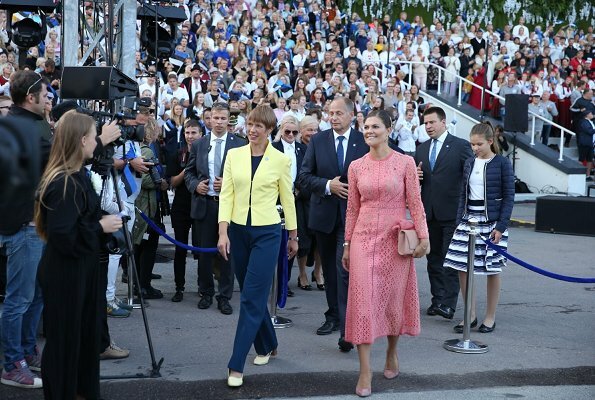 At the end of the day, Crown Princess Victoria and Prince Daniel, Estonia's President Kersti Kaljulaid and her husband Georgi-Rene Maksimovski attended a singing festival called "The Power of Song" (Laulu võim) held at the Song Festival Grounds in Tallinn. 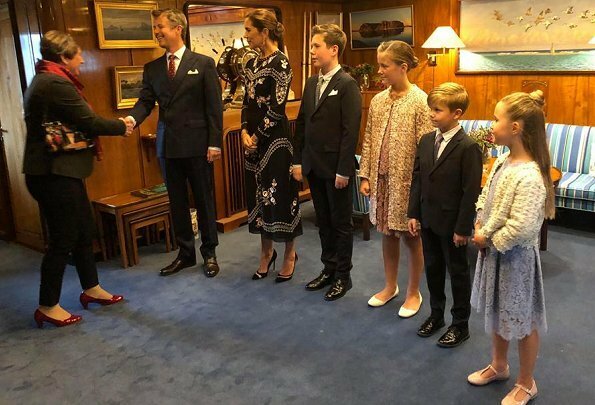 Crown Prince Frederik and Crown Princess Mary, together with their four children, pay an official visit to the Faroe Islands aboard the Royal Yacht Dannebrog the days of 23-26 August 2018. Prime minister of the Faroe Islands Aksel Vilhelmsson Johannesen hosts the visit. 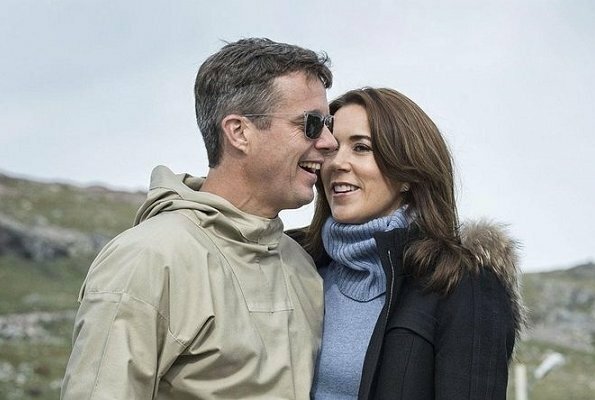 Crown Prince Couple will visit a number of towns and villages in the municipalities of Sunda, Runavíkar, Klaksvíkar, Fugloyar and Tórshavnar. The Faroe Islands are an autonomous country within the Kingdom of Denmark. On August 19, Sunday, Crown Princess Victoria and Prince Daniel visited Estonia on the occasion of celebrations of 100th anniversary of independence of Estonia. Crown Princess Victoria and Prince Daniel welcomed by President Kersti Kaljulaid of Estonia at Tallinn Presidential Palace. The program begins with an individual meeting and a lunch at the Presidential Palace. Then, the Crown Princess planted a tree at Kadriorg Park. During Tallinn visit, the Crown Princess Couple will attend a series of events. Crown Princess Mette-Marit of Norway (née Mette-Marit Tjessem Høiby) celebrates her 45th birthday today. The daughter of Sven O. Høiby and Marit Tjessem, she grew up in Kristiansand, and was educated in Norway. She met Crown Prince Haakon at Quart Festival. The couple married on 25 August 2001 at the Oslo Cathedral. Upon her marriage, she acquired the title, Her Royal Highness the Crown Princess of Norway. She is a patron of such organizations as the Norwegian Red Cross and the Norwegian Council for Mental Health. Happy birthday to you, Crown Princess Mette-Marit. 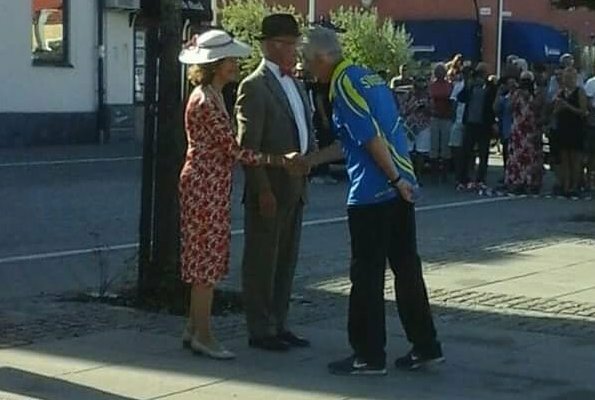 On Saturday 18 August, King Carl XVI Gustaf and Queen Silvia of Sweden took part in the King's Rally on the island of Öland. The Swedish King's Rally is this year organized for the 13th time, of which twelve of them have been arranged in Borgholm. The Rally started at 09.00 from Strand Hotell Borgholm and ends at 15.00.. Around 113 vehicles took part in the rally. The King drove a 1946 Volvo PV 60, which he received on his 50th birthday from Swedish King's Rally donors. 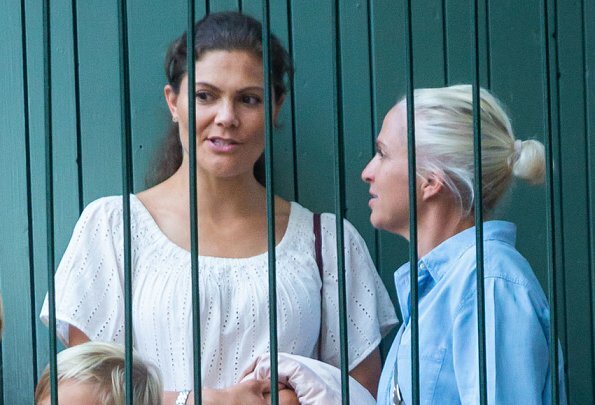 Yesterday, on Thursday, Crown Princess Victoria of Sweden, her daughter Princess Estelle, Victoria's close friend Caroline Dinkelspiel and her two sons visited Gröna Lund Amusement Park in Stockholm. On August 21, Tuesday, Princess Estelle will start to go to pre-school class at Campus Manilla's primary school at Djurgården. That visit became an entertainment for Estelle before starting school. (In addition to the related recent post) On August 12, a dinner was given by the Grand Duke and the Grand Duchess of Luxembourg who are currently on a holiday at their Cabasson mansion in honour of the French President and his wife. The mansion of the Grand Ducal couple is located beside Brégançon Castle which is the summer residence of the President of France. 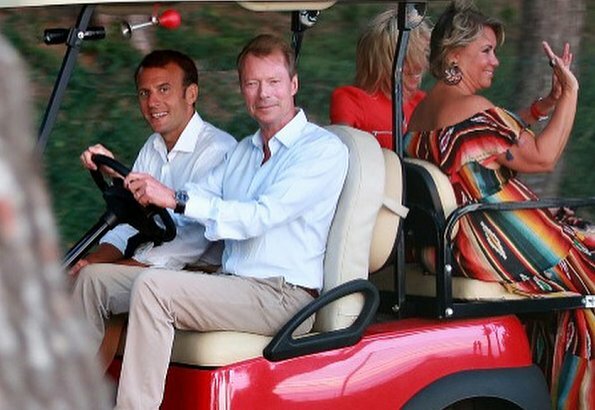 Today, the Grand Ducal Court released new photos of the couples, taken while the couples were on a mini electric car. 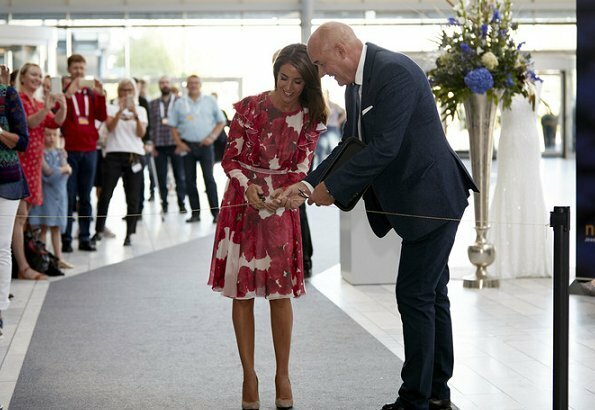 On August 17, 2018, Princess Marie of Denmark opened 2018 New Nordic Jewellery and Watch Fair held at Copenhagen Bella Center. New Nordic Jewellery and Watch Show is a special trade fair for the watch and jewellery industry and Princess Marie is the patron of New Nordic Jewellery and Watch Show. The fair gives companies the opportunity to meet new and existing customers. (Princess Marie wore rose print ruffled silk georgette dress by Giambattista Valli, which she had worn before). 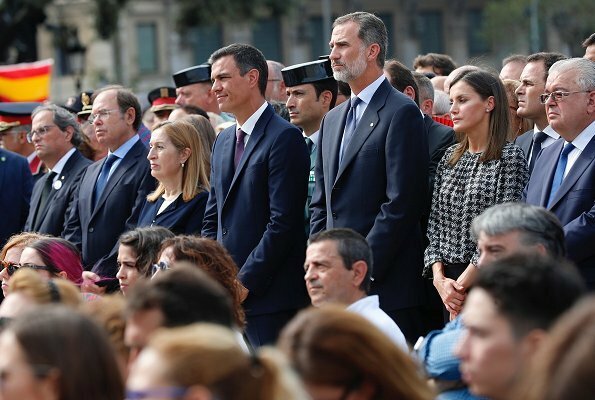 King Felipe VI and Queen Letizia of Spain attended memorial ceremony for victims of Barcelona and Cambrils terrorist attack, held at Plaza de Cataluña in Barcelona. The Barcelona city council organized a ceremony in memory of the victims of the Barcelona and Cambrils attacks where 16 people where killed and more than 150 injured.